I can think of a dozen good reasons why you would want to buy a wooden bike (ride quality, superb stiffness, environmentally friendly, etc.). My reason to buy one was different though. My parents run a custom wooden furniture building company for as long as I can remember, called DW Meubel. When I was a child I spend countless hours in the workshop, looking at furniture being built and building my own (mostly silly) things. Although I never really got any good at it, I did develop a passion for wood craftsmanship during my childhood. That is why, when I first came across a Renovo wooden frame online, I knew I had to have one some day. Whilst I am very passionate about the things my dad builds, he isn't exactly thrilled about the bicycles I build. That said, he was very excited when he saw the Renovo wooden frame for the first time. 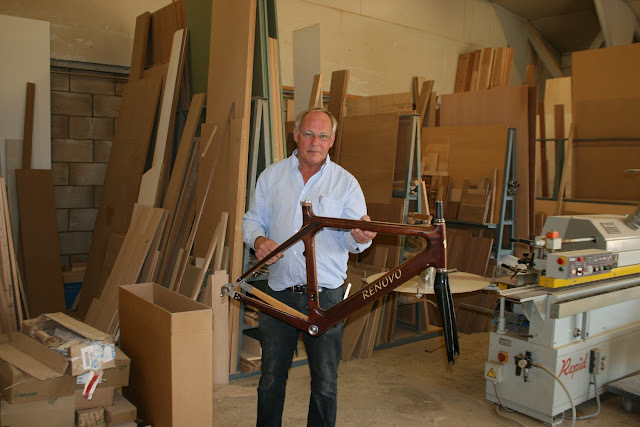 In the picture below you can see him holding the frame in the workshop. Maybe we should combine our skills and try and build a wooden frame together some day.